A strike planned by postal workers in five mail centres has been called off. Workers in Coventry, Crewe, Stockport, Bolton and Oxford had threatened to take industrial action on Friday over the proposed merger of some depots. There had been fears that a strike could cause significant disruption to Christmas deliveries. The Communication Workers Union, which has warned that 500 jobs are under threat, said it had called off the action after "some progress" was made. The union's deputy general secretary Dave Ward said the progress justified the "continuation of more meaningful discussions". Mr Ward said government plans to partially privatise the Royal Mail meant the stakes were "even higher". "This is no longer a local or regional dispute. What we face is the prospect of losing a much loved British institution," he added. A Royal Mail spokesman said: "We are very pleased that all our people will be focused on delivering the Christmas mail for our customers." Labour MP Jim McGovern resigned from the government on Wednesday in protest at the plans for the Royal Mail. Mr McGovern, MP for Dundee West, had been parliamentary private secretary to Business Minister Pat McFadden. 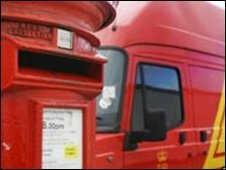 Business Secretary Lord Mandelson, who announced the proposals, has insisted that Royal Mail will remain "publicly owned".